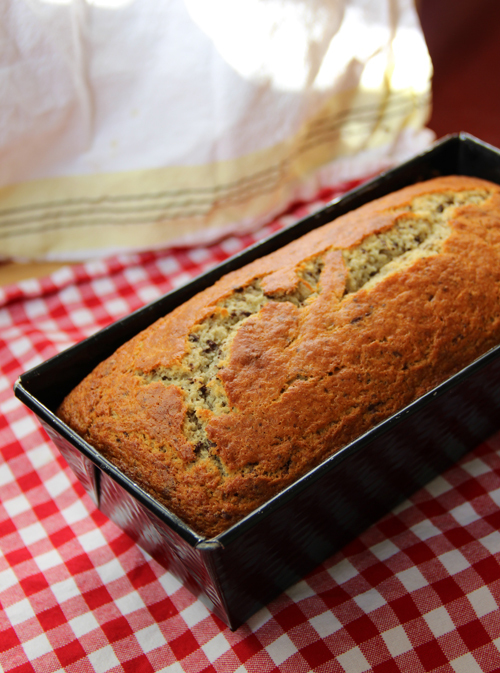 This is my favorite, fool proof banana bread recipe with a twist. Dark chocolate chunks make this classic homemade favorite a treat to remember! Preheat oven to 350ºF/ 180ºC. Butter and flour a loaf baking pan. Cream together butter and sugar. Add eggs, one at a time, beating well after each addition. Stir in pureed bananas and rum and/or vanilla extract. In a separate bowl, combine flour, baking powder, and salt. Stir dry ingredients into to wet ingredients quickly, then stir in dark chocolate chunks. 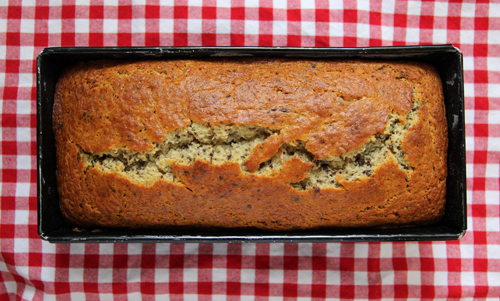 Bake in prepared loaf pan in preheated 350ºF/180ºC oven for 50-60 minutes or until banana bread tests done. Cool before slicing, but bread can be served slightly warm. Yum! Comfort food at its best.